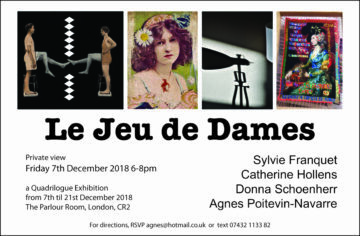 The Parlour Room is delighted to announce the wonderful forthcoming quadrilogue exhibition featuring the work of Catherine Hollens, Sylvie Franquet, Donna Shoenherr and Agnes Poitevin-Navarre. The private view will be held on Friday 7th December 6-8pm ish and the show will be on for three weeks until Friday 21st December. 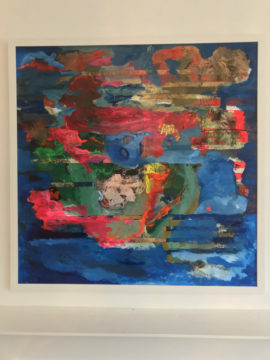 If you are looking at purchasing some beautiful original artworks, don’t miss this show! Contact Agnes for direction on 07432 113382. 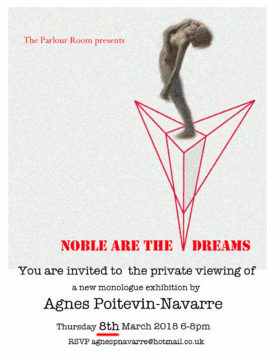 “Noble Are The Dreams” exhibition is now on. Not to be missed! Please make an appointment to see it. 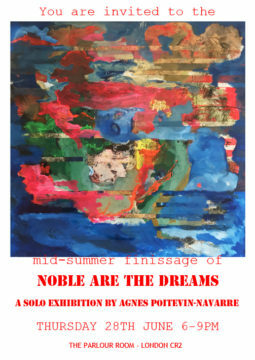 “Noble Are The Dreams” is a monologue exhibition encompassing drawings and paintings that explores themes of mythologies, stories and archetypes. 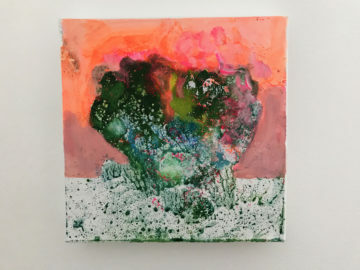 The colourful paintings, just like the ‘Murmurs” series did previously, are an invitation to contemplation yet, with very loose gestures, possible interpretations are multiplied. 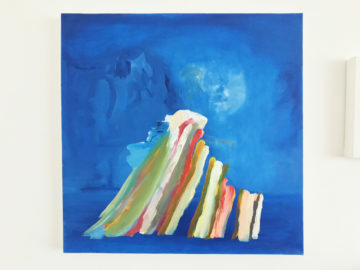 Presiding over the colourful work is the first part of a trilogy entitled “The Candidates” and two “Academic Lips” circular canvases sidekicks. 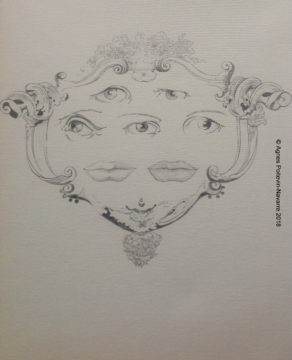 The eyes are the guides. The audience is encouraged to add their own reading. The curating of each piece interacting with others and the audience makes this exhibition quite unique. Not to be missed. 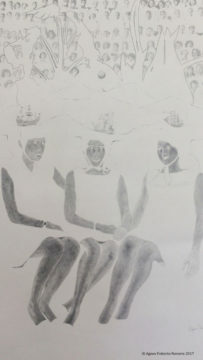 The finissage party will be on Thurday 19th April. Due to heavy snow conditions and train disruptions, “Noble Are The Dreams” is postponed by a week. Apologies. 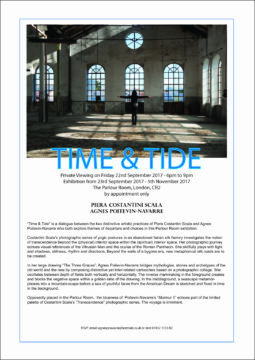 “Time & Tide” is a dialogue between the two distinctive artistic practices of Piera Costantini Scala and Agnes Poitevin-Navarre who both explore themes of departure and choices in this Parlour Room exhibition. Costantini Scala’s photographic series of yogic postures in an abandoned Italian silk factory investigates the notion of transcendence beyond the (physical) interior space within the (spiritual) interior space. Her photographic journey echoes visual references of the Vitrusian Man and the oculus of the Roman Pantheon. 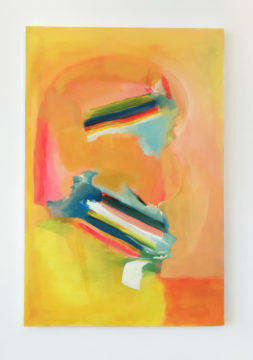 She skillfully plays with light and shadows, stillness, rhythm and directions. Beyond the walls of a bygone era, new metaphorical silk roads are to be created. 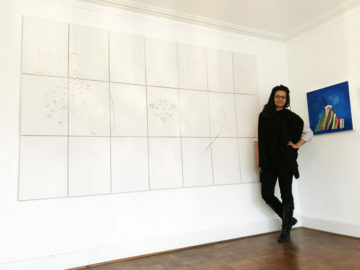 In her large drawing “The Three Graces”, Agnes Poitevin-Navarre bridges mythologies, stories and archetypes of the old world and the new by composing distinctive yet inter-related cartouches based on a photographic collage. She oscillates between depth of fields both vertically and horizontally. The inverse markmaking in the foreground creates and blocks the negative space within a golden ratio of the drawing. 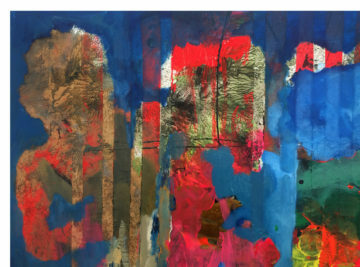 In the middleground, a seascape metamorphoses into a mountain-scape before a sea of youthful faces from the American Dream is sketched and fixed in time in the background. Opposedly placed in the Parlour Room, the blueness of “Murmur II” echoes part of the limited palette of Costantini Scala’s photographic series. The voyage is imminent.